We are often introduced to determinants as constructs of matrices but determinants have a geometric interpretation as discussed here. so the determinant allows us to determine if the vectors are independent so that they can span the space. What we are doing here is defining a set of basis vectors in terms of another. In other words defining one coordinate system in terms of another coordinate system. This is the same as representing a transform as described here. If |M| =1 then the transform represents a rotation (or an even number of reflections) from the original coordinate system. If |M| = -1 then the transform represents an odd number of reflections from the original coordinate system. If |M| is positive then the new basis vectors will have the same handedness, for instance, if the absolute coordinate system is right handed then the basis vectors will also form a right hand coordinate system. 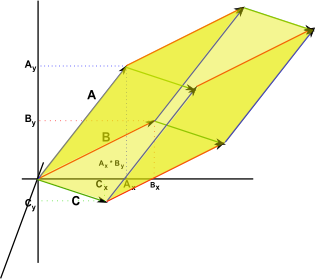 If |M| is negative then the new basis vectors will have the opposite handedness, for instance, if the absolute coordinate system is right handed then the basis vectors will form a left hand coordinate system. |M| is the volume enclosed by the vectors. However the sign is significant , it may be negative, if an odd number of coordinates are inverted the 'volume' will be negative. This is the same as the tri-vector of a 3D clifford algebra. the determinant of the matrix formed from the vectors, note how the order of the vectors is important here or we will get a negative area. 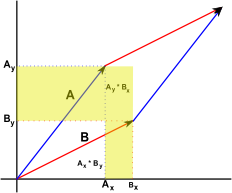 Which is the volume formed by the 3 dimensional parallelogram formed by the 3 vectors. In 'n' dimensions the determinant is the highest dimensional element (line, area, volume, hypervolume...) in that particular space. 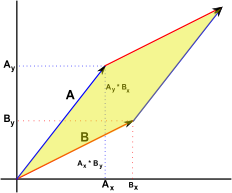 In Clifford algebra terms it is the scalar multiplier of the pseudoscalar.